…inside Heat Wave’s mind! Yes, the devastation we saw at the end of last issue was a construct in Mick Rory’s mind, and he has somehow pulled Flash and Burns into the scenario. 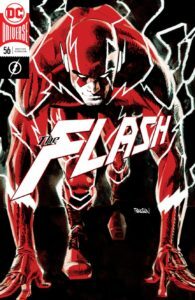 Most of the issue happens in this nightmare mindscape as Flash and Burns try to find the “lightning rod” that can restore Heat Wave to his usual self. They eventually find Mick’s childhood home and realize that they need to save the child version of Mick in order to stop the threat. Warden Wolfe tried to take the opportunity to kill Barry and Mick…but Commander Cold stopped that and took them to his apartment (okay, Barry’s old apartment) for safe keeping. Cold and Iris are pondering what to do about them at the end of this issue. Kristen is taking the opportunity during all the distraction to download a LOT of info that may eventually bring down Warden Wolfe. Barry is finally realizing that he may need to go on that Force quest, courtesy of some timely advice from Detective Burns. We’ll see if he gets that chance, as things are not looking good for Team Flash at the end of this issue. Some issues of the Flash make you feel like the issue is somehow longer than it actually is, while other issues race past (apologies for the unintended pun). This is one of the latter – the story went by exceptionally quickly, although that’s not necessarily a bad thing. The idea of looking for that lightning rod to take one home is a nice way of tying all the Forces together as a concept. These new Forces are certainly strange in so many ways, but giving the Sage Force that “hook” helps bring the concept into clearer focus…even though it is comic book physics. I liked Detective Burns making Flash ask for permission to carry her after he literally swept her up in an earlier save. It’s a nice nod to the need for consent even in this situation, and it worked well as part of the plot. Joshua Williamson is fleshing out the concept of these strange new Forces, and they are making more and more sense as we move forward. I’ve gone from wondering how they could possibly work in the DCU to actually hoping we will see more of these Forces after the arc is complete. There are a lot of interesting stories that have yet to be told, and Williamson is certainly the right person to spin those tales. Scott Kolins (pencils/inks) and Luis Guerrero (colors) were excellent for the most part. My only concern was just after the main splash page when Flash is asking Mick why he “killed” his friends (we later find out that wasn’t the case). Flash appears to be smiling while asking that – though it may have been intended to signify shouting…not sure. But, overall the artwork was great, and I really loved the opening sequence with the young Mick Rory. Overall I’ll give this issue an 8/10 – and I’m looking forward to what comes next. Of course, that’s my opinion – what to YOU think? Leave your comments below! Interesting that Kollins still draws Barry with the old Infantino style bolt around the waist. When he did it just before Flash War I thought they were officially putting Barry back in his old suit. But now it seems that even with Wally and Barry having drastically different costumes (and Wally’s not even present in this issue) Kollins just does this anyway.